Twinkling lights strung below skyscrapers, carriage rides ambling along, festive music and shoppers trickling out of stores decked in holiday trimmings — Chicago&apos;s famous retail row The Magnificent Mile (or "Mag Mile" as it&apos;s called by locals) is even more magical during wintertime. The downtown North Michigan Avenue district is where to head for the ultimate Christmas shopping spree in Chicago. Check off your gift list — and treat yourself too! 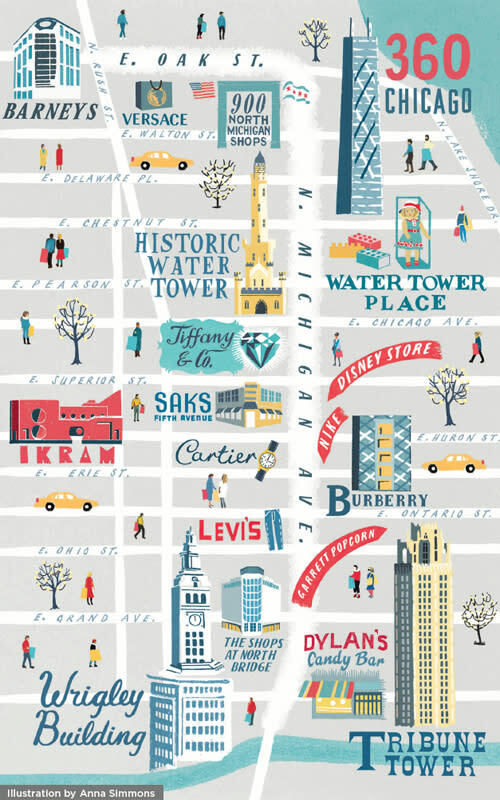 — with this Chicago Christmas shopping map and guide. With 460 retailers dotting The Magnificent Mile, well-known and loved anchor department stores include Bloomingdale&apos;s, Barneys New York, Nordstrom, Neiman Marcus, Saks Fifth Avenue and Macy&apos;s.
Insider Tip: Water Tower Place, The Shops at North Bridge and 900 North Michigan Shops will deliver your shopping bags to your hotel the same day, freeing up your arms for more exploring. One of the grand boulevard&apos;s three multi-story malls, you&apos;ll find national brands and unique boutiques (Gucci, Lululemon, Williams-Sonoma) within 70 stores on seven levels. Spanning six blocks with 50 world-class specialty shops, 20 sumptuous restaurants and five elegant hotels, you&apos;ll find everyone from Louis Vuitton to Stuart Weitzman here. Hit this historic mall to browse handbags at Coach and shoes at Clarks and find that perfect gift. Visit the eight-level atrium for adored doll store American Girl Place, brick emporium The LEGO Store and Candyality. Stop for a bite from one of 14 kitchens at foodlife. Insider Tip: Get tickets for a Historical Tour of Water Tower Place (Fridays at 3 p.m.) and learn the story behind the stately Chicago icon on a 30-minute guided walking tour. Step into the five-story black chrome, plaid-etched store and watch runway footage roll on a digital wall. Draped in velvet, marble and polished metal, the ambiance is as luxurious as the rings and crystal at this internationally renowned upscale jeweler. Denim in all styles, fits and washes go from classic 501® originals and hip skinny jeans to layering pieces like flannel tops and jean jackets. High end looks for women draw customers to this bright red boutique, home to haute fashion ambassador known around the world: Ikram Goldman. Luxe intersection Rush Street and Oak Street is home to many a designer label, and as of spring 2016, the Italian designer&apos;s Chicago flagship now resides in a two-level, 4,951-square-foot boutique. Geek out over all the latest gadgets, computers and accessories at this light-filled tech magnet. In the city that Michael Jordan built, Nike takes shopping to a whole new level — well, four levels to be exact — with a flagship that boasts a historic timeline of famous Air Jordan shoes on display, plus all the gear to play your sport of choice. Follow the enticing aromas to this gourmet popcorn shop. Be sure to try their most famous flavor, The Garrett Mix: a sweet-savory blend of caramel and cheese. The 2-level outpost of this colorful candy shop touts bins and bins of confections, plus a bar, cafe and dessert counter and bar to rest your legs (and refuel with a sugar rush). This Spanish Colonial Revival is an architectural gem celebrated as one of Chicago&apos;s most attractive buildings for nearly a century. You might recognize its dazzling white terracotta cladding and nighttime lighting from films and television shows. A Neo-Gothic icon, the limestone tower&apos;s elegant buttresses, intricately carved stonework and octagonal campanile serve as a grand gateway to The Magnificent Mile. Head to the 94th floor of 875 N Michigan (formerly the John Hancock Center) and take in a 360° view of four states from the 1,000-foot observatory. Try TILT: an exhilarating experience that tilts guests out and over the city streets below. Insider Tip: Stop by the Signature Room at the 95th restaurant for their decadent seasonal build-your-own hot chocolate bar.